As an online store owner, the easier you make it for customers to find what they’re looking for, the greater the chance of landing a sale. One way to achieve this is by making the process of buying from you as easy and efficient as possible, for example, by creating a WooCommerce product gallery lightbox. Practically speaking, if visitors are interested in looking at product images, you might consider implementing quick view functionality into your e-commerce store that allows them to view product images and galleries without having to navigate to the single product page. Full product image gallery (with a choice of 2 gallery styles). We’ll also step through some advanced display options to help you fine-tune your WooCommerce product gallery lightbox. WooCommerce Quick View Pro is a WordPress plugin that allows users to display product information and product images in a lightbox view. This makes it easy for customers to browse products and make purchases – without having to navigate to the single product page. Essentially, it works like a WooCommerce product image lightbox plugin. 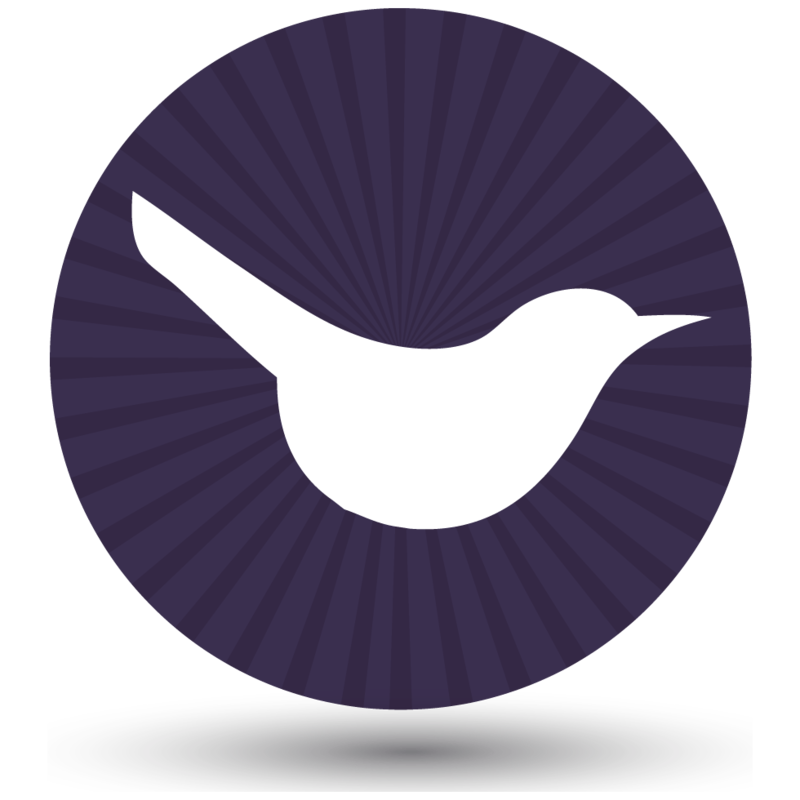 The quick and easy way to create a WooCommerce product gallery lightbox with image zoom! 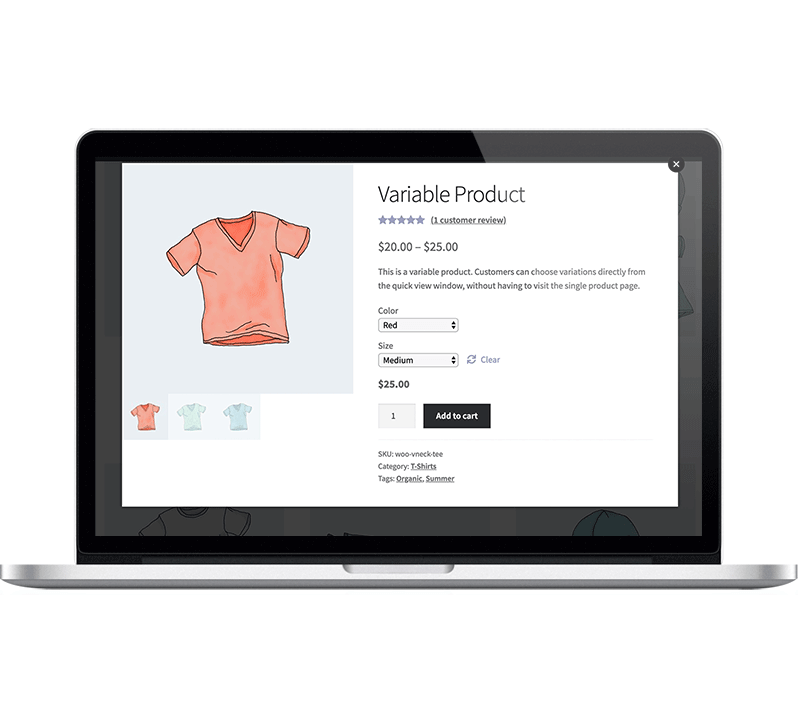 The plugin adds a quick view option directly to your WooCommerce store’s main shop page and category pages. 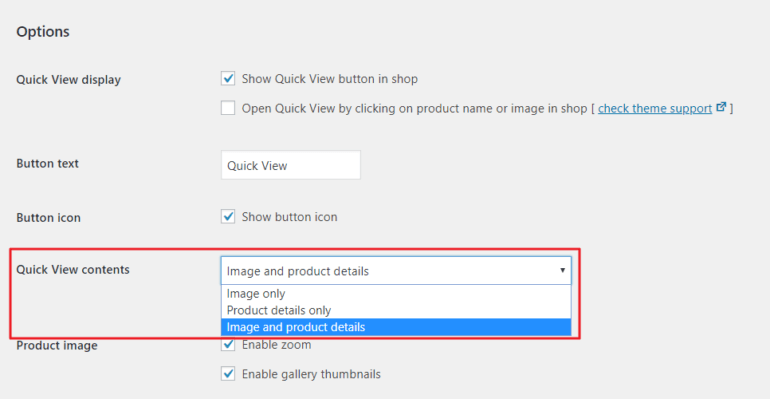 You also have the option to launch a gallery lightbox whenever a customer clicks on the product image or product name. This automatically disables links to the single product page i.e. the links are replaced with the quick view links. 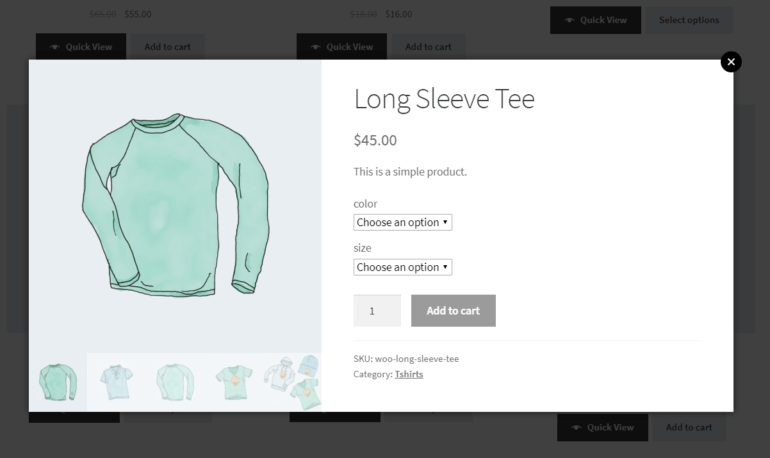 With WooCommerce Quick View Pro, you’re able to choose exactly which information from the product’s single product page (for example, product variations and attributes) you’d like to include in the quick view lightbox. As a result, you’re able to display the information a prospective customer would need to make a buying decision without any distractions or additional steps while delivering an outstanding user experience. WooCommerce installed, activated, and set up. Some products added to your online store. … follow the step by step instructions outlined below to create a lightbox containing product images, image zoom functionality, and the full product image gallery. If you haven’t done so already, get the WooCommerce Quick View Pro plugin and install and activate it on your WP website. I’ll tell you how to set it up as a WooCommerce product gallery lightbox plugin. Next, head over to WooCommerce –> Settings –> Products -> Quick view from the admin panel to activate the plugin license. You’ll notice that the Woo Quick View plugin automatically displays products in a quick view layout as soon as you activate it. Your main shop page (and category archives) should have Quick View buttons under each product. Out of the box, the plugin displays the above-mentioned information in the lightbox view. 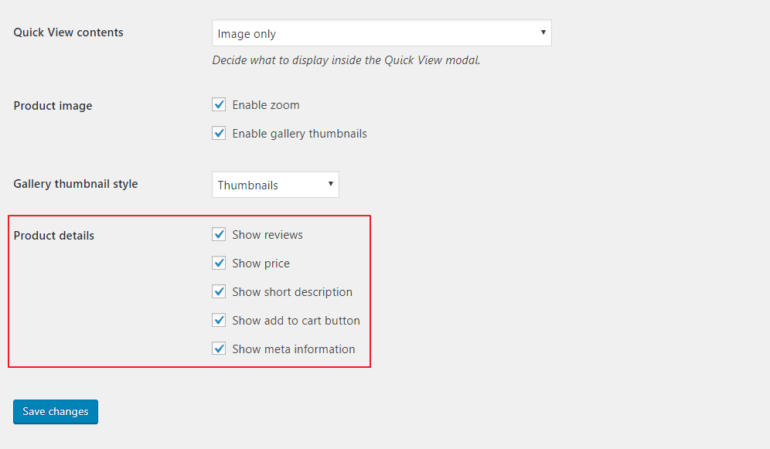 Simply tick the checkboxes next to the product details you’d like to display in the quick view lightbox. 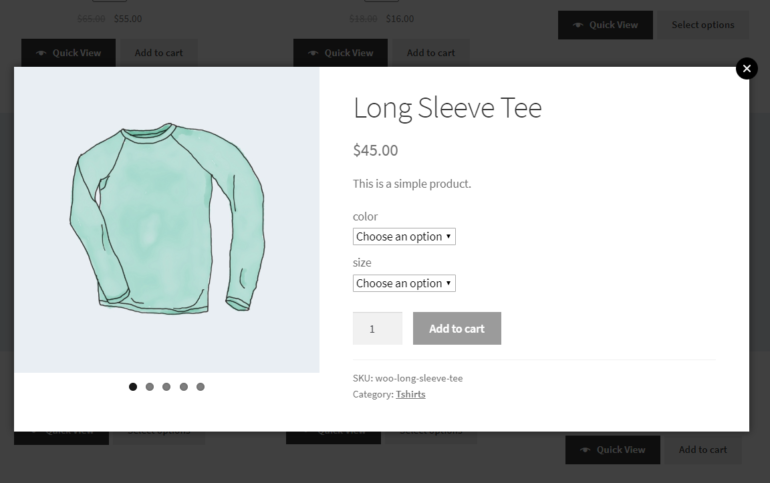 With WooCommerce Quick View Pro, you can choose how to display product gallery images in the quick view lightbox. You can decide between Thumbnails and Bullets. From the same screen (WooCommerce -> Settings –> Products -> Quick view), scroll down till you reach the Gallery thumbnail style option. Use the dropdown menu next to it to decide between displaying product gallery images as thumbnails or bullet navigation in the quick view lightbox. With the bullet navigation option, customers can click through the bullets to browse the product gallery. 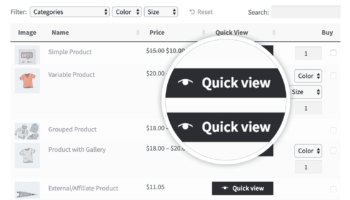 WooCommerce Quick View Pro integrates seamlessly with the WooCommerce Product Table plugin. Use them together to list products in an interactive table or order form layout, complete with add quick view buttons or links. 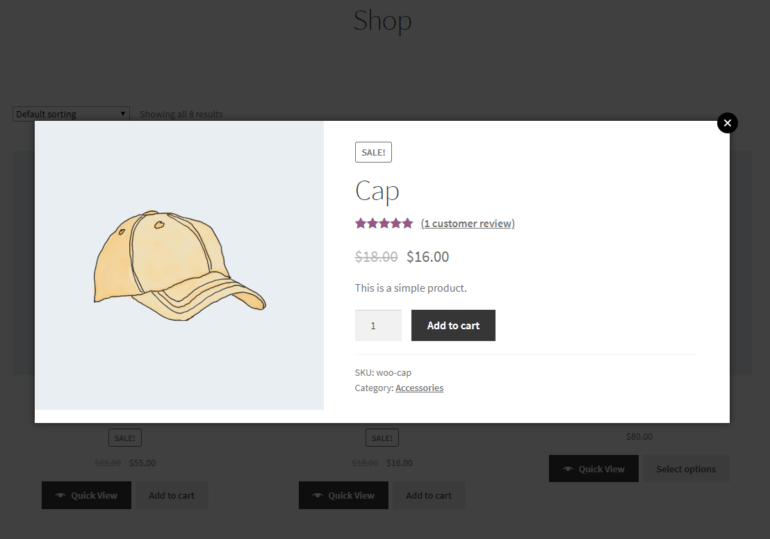 As a result, customers will be able to open up the full product image gallery in a WooCommerce product image lightbox directly from the table. Add quick view buttons or links to the wholesale order form. You can choose to add a Quick View button to the table. Or you can choose to have it launch whenever a customer clicks on the product name (or image) in the table. When both the WooCommerce Quick View Pro plugin and the WC Product Table plugin are installed and activated to your website, you’ll see a new Quick View Pro option the the WooCommerce Product Table plugin’s settings screen (i.e. WooCommerce –> Settings –> Products -> Product tables). Ticking the checkbox next to the Product links option makes it so the product page links in your table layout open the quick view box instead of linking to the single product page. This is the perfect option for users who want to completely disable the individual product page. Ink This and That sells different sorts of matching products including backpacks, dresses, t-shirts, swimsuits, and leggings. They use WooCommerce Quick View Pro along with WooCommerce Product Table to showcase their product galleries in a lightbox view. Whenever a customer clicks on the product image in the table layout, the product gallery opens up in a lightbox view. Customers can then zoom into the image and browse other images in the gallery. 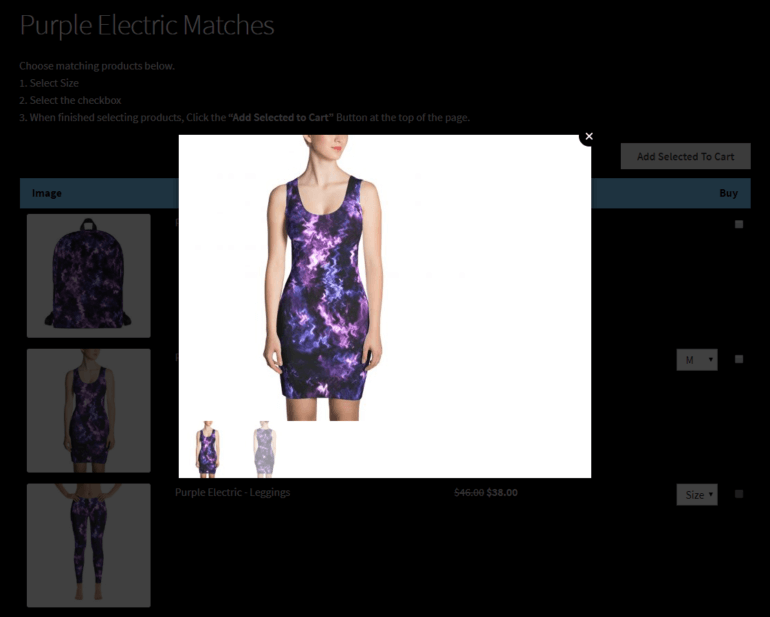 The e-commerce store chose to go with the Thumbnails gallery style for their WooCommerce gallery lightbox. For more information and detailed step by step instructions on how to set this up, be sure to check out this article in our knowledge base. Integrating quick view into your main shop page and category archive pages makes it easy for customers to view product images and product galleries without having to click through to the single product page. It effectively optimizes the purchase process and helps you deliver a professional and enhanced user experience to your customers. Do you have any questions about how to use a WooCommerce gallery lightbox plugin in your own online store? Let us know in the comments below!